Despite the chaotic state of my desk, I generally consider myself to be an organized person. Keeping up with multiple deadlines, writers, product releases, and general life stuff requires a certain amount of mental tidiness. 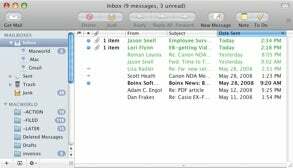 Then one day, while discussing a story about organization with the esteemed Joe Kissell, I happened to mention that my e-mail inbox contained more than 35,0000 messages. And I’m pretty sure I said this with a certain amount of pride in my voice. Joe’s inbox count at that moment? Zero. Turns out, Joe files every message away as soon as it comes in. But he listened good naturedly while I explained the logic of my one-place-for-everything system. I pointed out that didn’t have to spend any brain power on filing, that every e-mail was a quick search away, and that I could quickly scan to see past e-mails. Ultimately, we decided to agree to disagree. In fact, the article that resulted from that conversation presented both organizational approaches. But the truth is, I wasn’t telling Joe the whole story. While my system generally worked for me, it had its shortcomings. For example, I often lost track of messages that still needed to be dealt with. As new messages arrived and older ones disappeared from my screen, I seldom thought to scroll down to see what was still unread. And although I’d developed elaborate coping mechanisms (using colors and flags and searches to identify messages) simply having an ocean of e-mail in front of me made the process of answering and checking e-mail seem like a Herculean task. Although I’d never have admitted it, opening my inbox stressed me out. Then two things happened: I performed a clean install of Leopard in hopes of getting a fresh and stable upgrade; and I switched from Microsoft Entourage 2004 to Apple Mail 3. Suddenly I was in the mood for a fresh start-and my massive Inbox seemed somehow out of place. This is just a tiny view of what my inbox looked like in Entrouage 2004—not even two-days worth of mail. So I went back to Joe and asked him to write an article on how to put his e-mail system in place-you know, for the sake of our readers. What I wanted to know was not just the theory behind his system, but how to actually take a massive inbox, clear it out, and change the way the owner works with e-mail forever. Joe’s resulting e-mail renovation guide—which we’ve broken down into a three-day process, starting today-isn’t about creating elaborate file structures or ruthlessly deleting e-mail. It’s a practical guide to reducing the amount of e-mail you receive, creating a very simply workflow for dealing with the e-mail you do receive, and being realistic about how you work with your old e-mail. Although his system is the result of his own trial-and-error experiments, many of his strategies were inspired by productivity experts like Merlin Mann and David Allen. And it offers some useful tough love for e-mail packrats like myself. While editing Joe’s story, I put his advice to the test with my own massive inbox. And I have to say, I was surprised at how easy the transformation was. Because Joe limits his folder system to just three mailboxes, the decision process for each message is relatively simple. It’s also customizable. For example, I’ve add a couple of additional mailboxes to my system to address specific types of messages, such as those with invoices. In fact, the hardest part of the process for me was letting go of the strange and irrational belief that the sight of those messages in my inbox was a sign of all the work I was accomplishing-a badge of honor, if you will. This is a snapshot of my current e-mail inbox in Mail after taking Joe's advice to heart. As I write this, my inbox holds nine messages (hey, I’m still learning). The folder containing all of my old messages is just a click away, should I need to search for something and my reminders and tasks are in a more appropriate location (rather than being scattered about in flagged messages). I’m also more efficient, since I can immediately identify the messages that require my attention. But the biggest change is the reduction in stress I feel. I no longer dread opening my inbox in the morning. To be honest, I hadn’t even realized how overwhelmed I’d felt until the first time I came back from a meeting and saw that I only had four messages waiting for me. Four! That’s doable. So I dealt with them right then and there. Is the system ideal for everyone? Probably not (though Joe may disagree). If you have an e-mail process that works for you, by all means keep it! But if you’ve been wondering whether there’s a better way or feel overwhelmed by your inbox, try out Joe’s system over the next few days. If it works for you, let us know.